Tallahassee, FL – The School of Theatre at Florida State, known for its nationally reputable program, encourages the creation of art, defies standards and makes bold moves to produce caliber productions. 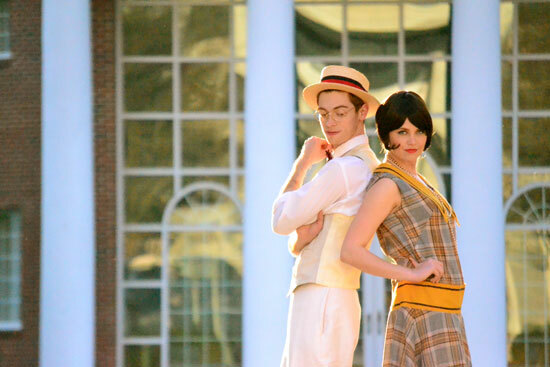 With the upcoming presentation of William Shakespeare’s comedic classic Much Ado About Nothing, director Walter Kmiec embraces the spirit of experimentation and sets the production in Southern Florida during the glamorous 1920’s. This show will run from March 29 – April 7 in the Lab Theatre, located by the Pensacola Street parking garage. As one of Shakespeare’s earlier works, Much Ado About Nothing falls right before arguably his most successful plays – following this piece of work he composed the beautifully potent tragedies Hamlet, Macbeth, and Othello; thus, Much Ado embodies a turbulent mix of feelings that emotionally charge this production. Typically set on the island of Sicily, Kmiec’s unique spin on Much Ado sets itself up in a lush, Southern Florida estate for the glamorous vision of the rough approximation of the 1920’s – paparazzi, fame, stardom and allure. The encapsulation of the decade lends a major role into the world of this play. With that dramatization, the importance of reputation and social rank is imminent; thus, the 1920’s status-obsessive culture inspired Kmiec’s vision for this particular production. The plot of Much Ado centers around two sets of lovers. Benedick (Chris Martin) and Beatrice (Denee Lortz) are tricked into confessing their love for each other; all the while Claudio (Casey Leach) is tricked into rejecting Hero (Sarah Jo Provost) at the altar. These unsuspecting lovers are lead to questioned intentions and illuminated desires. To those who may shy away from Shakespeare due to the density of the language and content, fear not – for this production will be relatable to audiences on numerous levels. Much Ado presents the opportunity for the community to experience a world of Shakespeare that will take them on an emotional rollercoaster; and that is precisely what Kmiec is aiming for. Join the director, designers, and dramaturg in a talk back session directly after performance on the Thursday, April 4. For additional media or information contact: David J. Valdez – (813) 624-3034 or djv11b@my.fsu.edu. Photos from “Much Ado About Nothing”. Chris Martin and Denee Lortz. Photo by David J. Valdez.